This contest has ended. Congratulations to all of our winners! Be listening to win on “Nerf Warz Wednesday”! 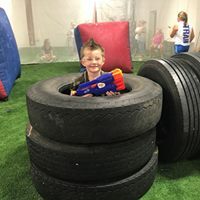 Wilmington’s premiere indoor foam dart battlefield – Crossfire Paintball and Nerf! It includes unlimited playing time! Sooo much fun for your kids! Win a prize pack and you’ll instantly qualify for a Crossfire birthday party for your little one and 7 friends! Not everyone can surf, but everyone can nurf!